Most people who enjoy taking images of birds will attest to the fact that it can be especially challenging to photograph hummingbirds. These little ‘pocket rockets’ dart around constantly and very seldom stay in one place long enough for us to find them in our viewfinders, let alone actually get an image. If you’re like me even being able to capture a decent image of a hummingbird on a feeder with its wings spread is an uncommon feat. I have always been intrigued with hummingbirds and really wanted to be able to capture images of these unique birds in flight – but without the hassle of using complicated flash set-ups, or the use of a tripod. 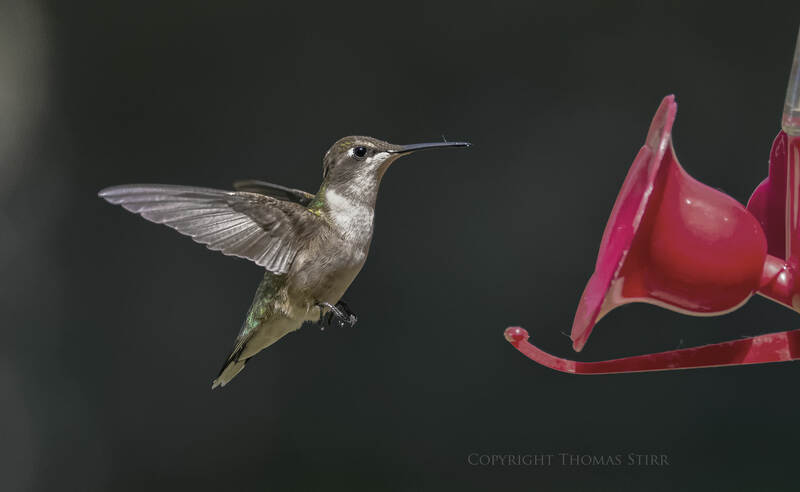 This article shares some simple techniques I used to capture a number of images of hummingbirds in flight shooting hand-held. None of the images in this article would be considered ‘award winners’ by any stretch of the imagination, but they do represent results that I believe a lot of folks can achieve using very simple gear and technique. 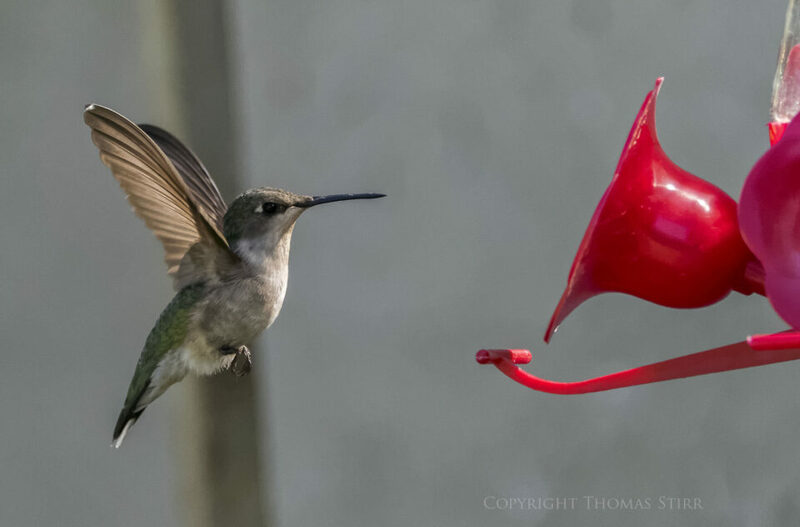 The first challenge of course is to find a location that has a good population of hummingbirds. To get the images for this article I went to Ruthven Park in Cayuga Ontario. There is a bird-banding cabin on site that has a few hummingbird feeders and appropriate plants to attract hummingbirds. 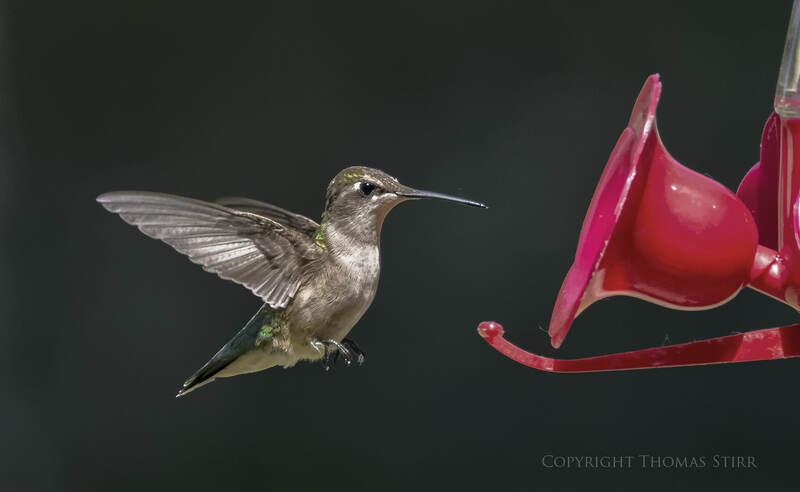 Regardless of where you live patience is required to photograph these little critters so bring a lawn chair or find a comfortable place to sit close to a busy hummingbird feeder. To have any chance to even partially freeze the wing movement on a hummingbird you’ll need to use a fast shutter speed. The slowest shutter speed I used was 1/2500 and many of the images in this article were shot at 1/4000. I’d suggest using manual settings on your camera so you can control both shutter speed and aperture. To get the proper exposure use auto-ISO. I used my Nikon 1 CX 70-300 f/4.5-5.6 lens mounted on one of my Nikon 1 V2’s to take all of the images in this article. 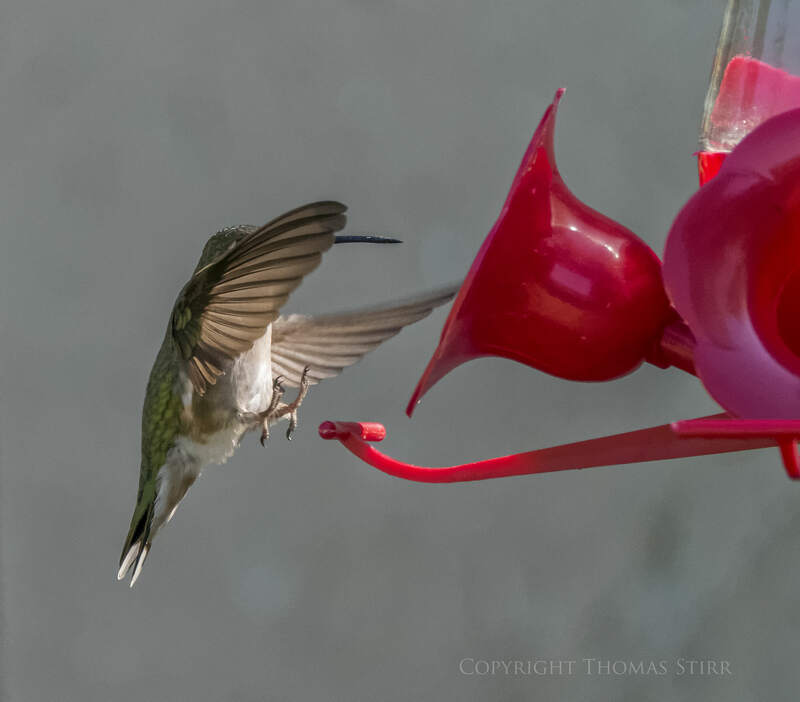 That set-up gave me an equivalent field-of-view of 810mm and allowed me to photograph the hummingbirds from a distance of about 3.5 metres (11.5 feet). This allowed me to capture them at a reasonable size to help avoid really aggressive cropping in post. I found that if I got any closer the hummingbirds would either stop coming to the feeder, or they would choose to sip nectar from the opposite side and thus block my view. I’d suggest using the longest focal length lens you have and get in as close as the birds will allow. You will only have a split second to capture your images so its important to use AF-C with subject tracking on your camera, and shoot at a fast frame rate. I used 15 fps in AF-C with my Nikon 1 V2. Hummingbirds tend to hover for a split second before they land on a feeder. This varies by individual bird but I found that this hovering distance was about 6 to 12 inches (15 to 30 cm) away from the perch on the feeder. To have the best chance to capture a hummingbird in flight I found that pre-focusing my lens on the perch of the feeder, then aiming it at the ‘dead spot’ where I thought the hummingbird would hover, allowed me to capture the most number of decent images. This is the tricky part for most people. While looking through the viewfinder of your camera (which is aimed at the ‘dead spot’ where you anticipate the hummingbird hovering), keep your left eye open and look at the entire hummingbird feeder scene simultaneously. This will allow you to notice a hummingbird entering the scene and alert you to a potential AF-C run opportunity. If you keep your left eye closed the action is likely to happen so quickly that you will not be able to depress your shutter in time to capture the hovering hummingbird. Technical Note: All images were taken hand-held using a Nikon 1 V2 with Nikon 1 CX 70-300 f/4.5-5.6 VR lens in available light. Images were produced from RAW files that were processed through DxO OpticsPro 10 including PRIME noise reduction. A DNG file was then exported into CS6 and Nik Suite for additional adjustments as required. 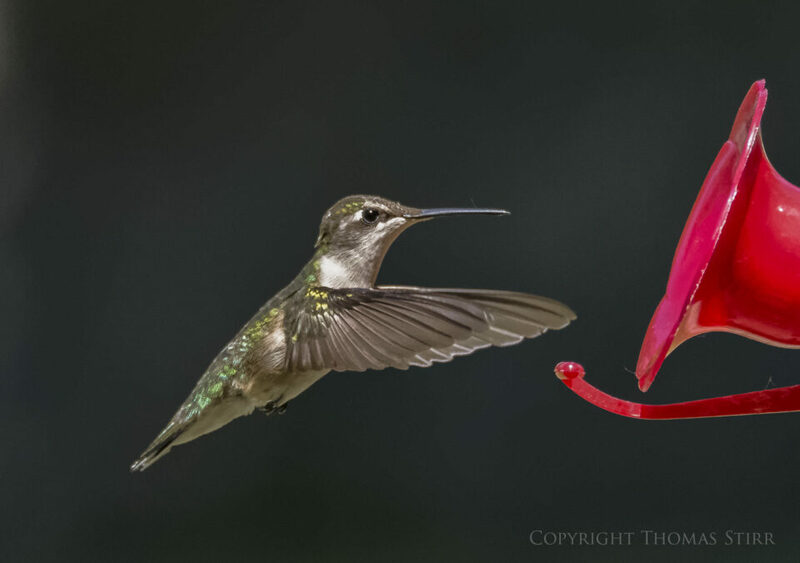 I sit patiently between 10-15 feet from my Firebush plant with my D600, 300 f4E PF VR, and TC14E II. I prefer to not use flash. Flash seems to bother them somewhat. You can see my recent hummingbird shots at johncgamblephotography.blogspot.com/ . I usually use 1/2000 sec, f8 with Auto ISO. Thanks for sharing your images! You have quite a range of visitors to your firebush plant! I’ll have to see if something like that will grow up here in Southern Ontario. Thanks, I needed these ideas. Great stuff Thomas. You definitely need a camera with OVF or EVF to set your shots up. Experimenting with my J4 has been problematic in broad daylight, as you can’t see the screen. I’m curious, how long can you fire off 15 fps before you’re buffer’s full? Whether I’m at 10, 20, or 60 fps, I max at 20 frames in RAW. Thanks for the positive words – most appreciated! The buffer varies by model of Nikon 1 camera. With the V2 I can usually get about 40 images or so…and that’s shooting in RAW + jpeg fine. You’re absolutely right that having an OVF or EVF is really needed for these kinds of images. I bought my wife a J1 on sale prior to our trip to Greece so she’d have a camera she could use – and also use my selection of 1 Nikon lenses. She had a hard time using it as well as it was very hard to see the screen in bright sunlight. When we got back from Greece I sold the J1 and bought her a V2 on sale. Hopefully I’ll have better luck underwater where the camera’s main intent will be, as the screen will be recessed in the underwater housing. Nice capture Spy Black…thanks for sharing! Thanks for sharing the image chandrasekaran! Nice! May I suggest, however, considering making this so much easier: use a serious macro lens with a flash unit that can hold three Speedlights. Run them at full power, point the camera at the bird and say, “Hey,”… when it looks at you, flash the hek out of it, which will stun the bird for at least 5 seconds, giving you easy recompose opportunities to capture never-before-seen birthmarks before the bird even knows what hit it! I mean, you gotta use the big guns on these speed demons! Hi Keith, thanks for adding some thoughts on additional techniques to the discussion. I do hope you realize I was just kidding! :-) Yup….but these little guys can be so hard to capture at times that even ‘tongue in cheek’ techniques could prove useful! Why would anyone use Live View with one eye closed? Did not use Live View…used viewfinder with camera hand held, no tripod. A very informative article–it comes at a very opportune time as I’ve been struggling with this! Thanks! The title is misleading, in order to be able to shoot at such high shutter speeds you need very good lighting, in the absence of which people use expensive flashlights capable of high speed sync. The techniques described in this article are pertinent to the focus mechanisms and apply to flash photography too. Glad you enjoyed the images in the article…and thank you for sharing your San Diego photos! I like some wing blur in images of hummers because it conveys a sense of the incredible speed of their wing action. Your very high shutter speeds generate a static image with no wing blur. No right or wrong to this, but what are your thoughts? Also, not so easy to hand hold with a DX or FX setup. I think a monopod works well with heavier gear for hummers and other small birds in flight. Again, your thoughts? There are many approaches that can be used to capture these beguiling little birds in flight and I think many folks would rather shoot with a monopod than hand-held. If they can get the images they want shooting in that manner I don’t think it matters at all. You make a good point that using a monopod would make shooting with FX or DX gear much easier and it would make sense for folks to consider that if they own larger, heavier gear. 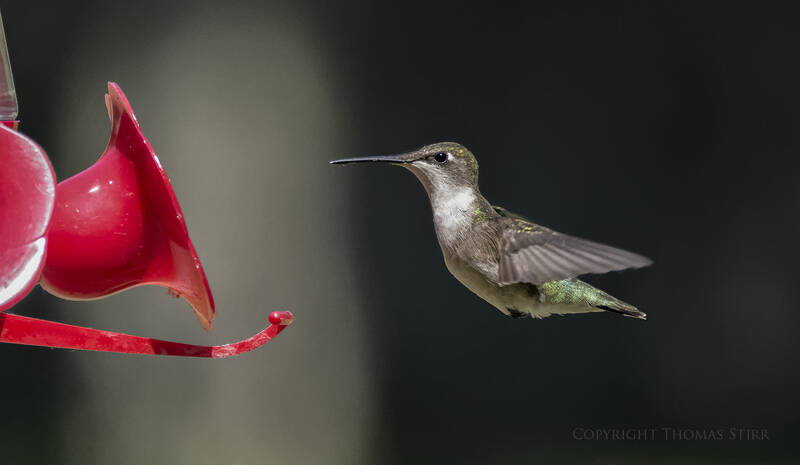 I’ve tried using a monopod for birds-in-flight (although not hummingbirds hovering near a feeder) and I find it too restricting – but that’s just me. As far as wing blur goes I think this is a personal choice. You preference, as well as that of many other photographers, is to have some wing blur to convey a sense of speed. Personally I would rather come as close as possible to freezing the action so that the bird’s details are better displayed. I also like my images to capture interesting wing positions as I think it adds to the overall appeal of the image – but that is obviously just a personal preference. I suppose whether someone finds it ‘better’ to use full frame, cropped sensor, or smaller sensor cameras like a Nikon 1 for these types of images depends on their objective. Shooting in AF-C at 15 fps or 20 fps with a Nikon 1 does allow for a wider assortment of wing positions in resulting images while shooting with a larger sensor camera does provide better overall IQ. Much of this, of course, depends on the gear that someone owns and how much money they are prepared to invest. There’s no doubt that shooting with a full frame body with a large, fast telephoto lens will generate better IQ than I can get with my Nikon 1 gear. The downside of course is weight and cost…like everything photographic there is always a trade-off! The limited dynamic range of the CX sensor in my Nikon 1 V2 is very apparent in the images in this article and it is a significant impediment to overall IQ. I’m hoping that the new BSI sensor that Nikon is now using in the J5 has much improved dynamic range and colour depth. I’m waiting on formal DxO test results to find out. If it does I hope that the sensor finds its way into a future V4. If the dynamic range of the new BSI sensor in Nikon 1 cameras is above 12EV and if the colour depth is above 22-bits (both significant improvements from current performance i.e. 10.8EV and 20.2-bits) I will really need to think long and hard about whether it makes sense for me to keep my FX gear. I have a MeFoto carbon fibre travel tripod that can be reconfigured into a monopod. Based on our discussions I’m going to give that a try the next time I’m out at Ruthven Park trying to get some additional hummingbird images. I’ve also been looking at a Manfrotto Video Monopod that also may be able to do ‘dual duty’ for me and also help support some still photography. I’m an ‘old dog’ but always willing to try a ‘new trick’. I’ll let you know how that works out. The key for me to the monopod setup is using a tilt head along with a shoulder harness. I keep the pod attached to the camera/lens, extended to the right shooting height, and tilted up so that it is resting behind my armpit with the camera/lens attached to the shoulder harness. This steadies the whole rig when I’m walking. Then when I’m ready to shoot I only have one quick adjustment to make to the tension knob on the tilt head to swing the pod down so it is perpendicular to the ground. There are advantages of this rig compared to hand holding for image stabilization and framing. But more important, it makes it possible for me to walk for a couple of hours with a D7200 & 500mm f/4 without aches and pains (and I’m no youngster). Without this setup it would be your Nikon 1 package or giving up the type of wildlife photography I love. Kirk sells a great tilt head that is expensive. Sirui sells an excellent knock-off for half the price. Ishoot, Desmond, and others on eBay sell a knock-off of the Sirui knock-off for $50 or less. I own the Ishoot and the Sirui. Adjustment knob is bigger on the Sirui, which is good. Otherwise pretty much the same. Manfrotto sells a tilt head for even less but it doesn’t have the tension adjustment tilt mechanism that is the key component of the aforementioned brands, and it doesn’t take an Arca Swiss plate. I use a Blackrapid shoulder harness. Carbon fiber monopods vary a lot in weight as a function of rated load capacity. I don’t think the load capacity of the tubes is itself important, and you want the lightest one that gets the job done. But the twist joint connectors on the lightest pods don’t have sufficient grabbing power to support a heavy lens, which means the pod will often get shorter on you while you’re shooting. I know you don’t need this information, but some readers might find it useful. Best wishes on your monopod experiment. Thanks very much for sharing of this information! I’m sure many readers, including myself, found it very useful. I actually went out today with the monopod version of my MeFoto travel tripod and tried to take some images of swallows landing at bird houses at Mountsberg Conservation area. I did get a couple of pretty good captures…but since the birds are far less erratic landing at their nesting site I’d probably use a tripod and IR remote next time. Never-the-less it did work just fine with the monopod. All of this just adds to the experience base and has my mind already contemplating a few other test set-ups to capture hummingbirds in flight…as well as some future swallow images. I’d love to figure out exactly how you use the pod attached to the camera while you also attach the camera/lens to the shoulder harness. An image is worth a thousand words and after many iterations reading your lines I still can’t figure out how you manage to attach the whole thing. I recently bought a 600mm Nikon lens and I’m breaking my head trying to figure out how to hand held that monster. I’d appreciate very much your help on this matter. Thanks. Thanks for sharing Scott! I was also pre-focusing on the perch on the feeder then aiming my V2 at the general area where the hummingbirds momentarily hover before landing. You have a wonderful collection of images…thanks for sharing! Would you mind sharing your flash technique with readers? I’m sure they would be very interested. Some of these sure are award winners to me! Very Nice Images. I am just starting down this Hummingbird path, and what fun it is. I am not getting the quality images yet that I am eventually hoping for, but am sure learning a lot along the way. I am using a Sony A6000, and trying different lenses from my SLR days with adapters for the E mount. My longest lens for now is an old vivatar 75 to 210mm, but am also trying an old, Tokina 75-150mm f 3.8, and my Nikon 105mm f2.5 afghan girl lens, so that will have to do for now. I do all my shooting in full manual mode. PS: wanted to share a couple picts, but don’t know how to add them to this post, sorry. Thanks for the positive comment – much appreciated! None of us is ever immediately successful when we try new things with our photography. Just keep experimenting and having fun and your images will keep improving. It all really depends on how much wing movement you want in your images. I like to try to ‘freeze’ wing movement as much as possible. Hummingbirds required quite a fast shutter speed and even at the speeds I used the wings are perfectly ‘frozen’ in the images. I find the small amount of wing blur acceptable. I came across your article and have found it very useful and inspirational, I love your shots. Being the third week of August I do feel a little late to the party for this year, but I am experimenting with different suggested settings for my shots each day. I have some shots that would impress novices, but I have yet to get “the shot”. My gear is the Nikon D7100, using a Nikkor AF-S 55-300mm, f 4.5 – 5.6 lens. I have tried the recommended AF-C setting but cannot get focus, so for me the AF-S works best. I am shooting handheld and can get about 8 ft. from the feeder and sometimes as close as 6 ft. I am shooting in Manual mode and have tried shutter speeds of 1/2500 – 1/4000, too early to say but my best shots so far have been 1/3200. I set ISO to Auto today and may go back to 400 and other values tomorrow. Having fun experimenting just the same and thank you for making is uncomplicated. I’m glad you found the article helpful and that you are having some success photographing hummingbirds! I’m not sure where you are located, but I’m in the Niagara Peninsula of Canada and August is prime hummingbird season. The chicks are fully fledged and many adult birds are beginning the early stages of their migration so there tends to be a higher population density of hummingbirds in August. 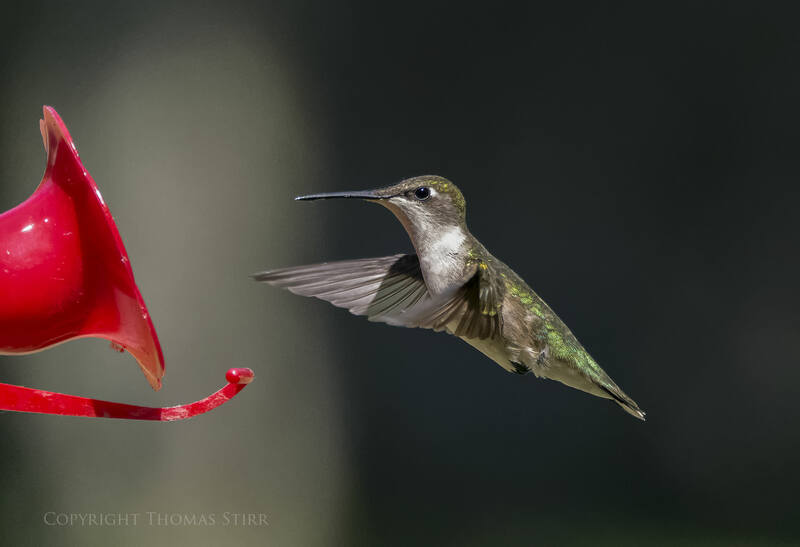 I love photographing hummingbirds but I’ve been quite busy with client work and I haven’t been able to spend as much time as I would like capturing these tiny, feathered rocket ships! 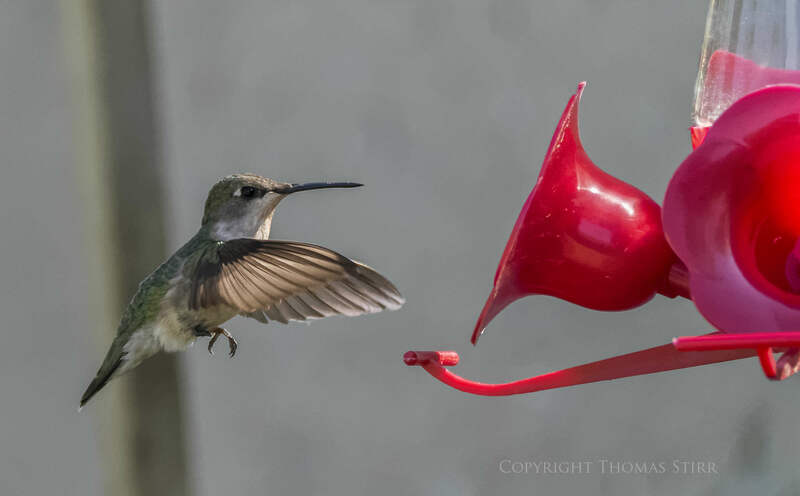 When using AF-C you may find it helpful to pre-focus your lens on your hummingbird feeder, then slider it over to a hummingbird when it arrives. 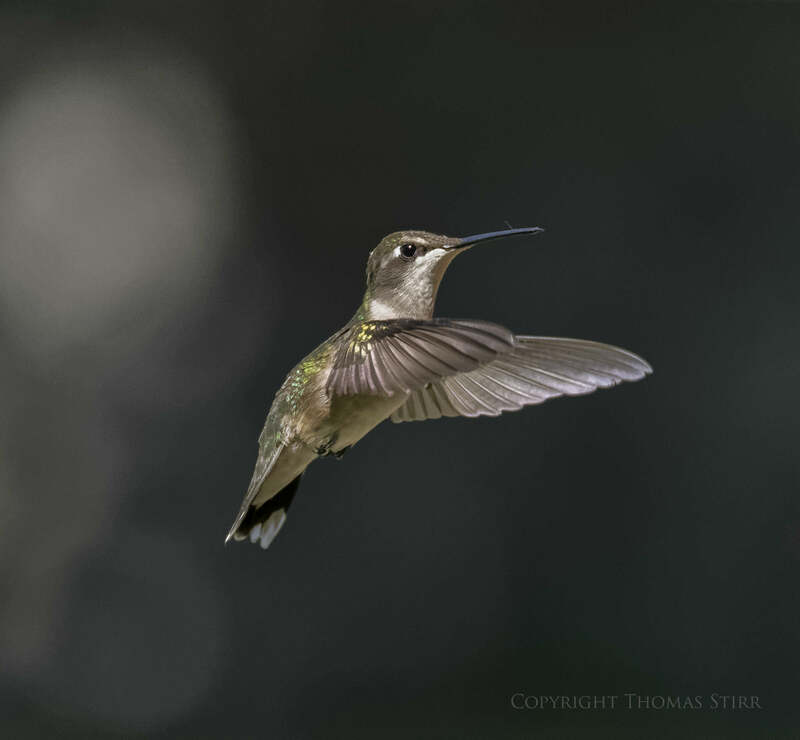 If you visit my blog you’ll find quite a few more bird photography articles, including hummingbirds. Thank you for your reply. I live in Toronto but am currently at the cottage on Lake Scugog. I am seeing lots of active feathered rocket ships, they actually chase each other away as do the bees. 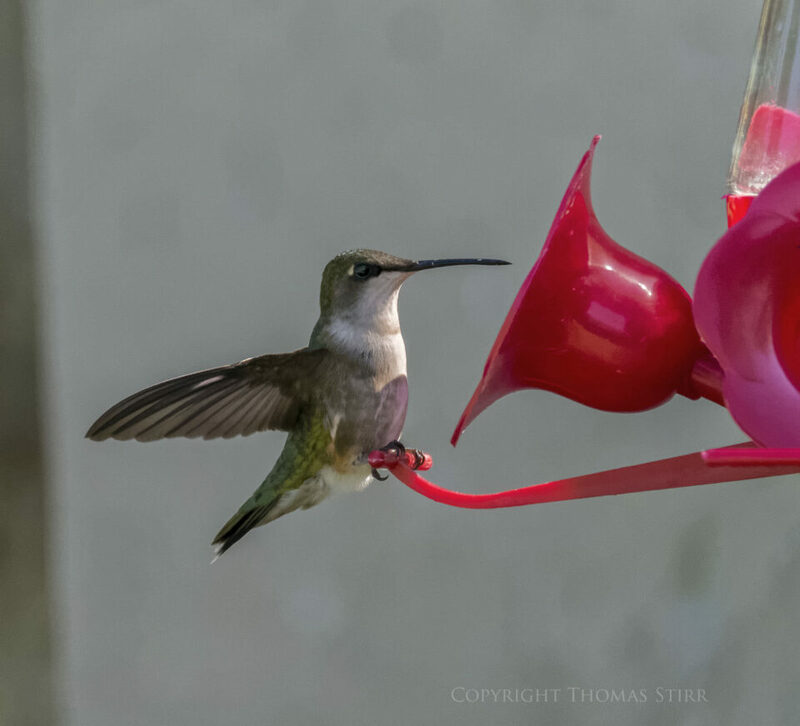 ps: Last year I had the pleasure of watching (not shooting) a mom hummer showing her fledglings all the “spots” including my feeder! It was awesome. That must have been a wonderful sight to witness i.e. the mom hummingbird with her chicks! It was amazing to watch and if you think hummers are small you should see the young ones! I persevered all week long and experimented with different settings. My biggest obstacle has been image noise, I use Topaz DeNoise, even with that I was losing detail. Today I set the ISO to a MAX of 800, then tried fixed at 320. I was more successful today and actually got two images I am quite pleased with….I would love to share them with you if you would like to see them….not for critique but just to share my excitement. Sounds like you are on a real adventure! I’d love to see your images. You can get my email address from my website(s). Love these, Tom! I’ve been trying to capture shots of the ones feeding on my pentas and firestorm bush–have a few that were visible, but tried what you’re doing and finally managed to see the wings. Love it! Still not as great as yours, lol, but I’m learning. I’ve also captured blue jays mating with wings spread, and woodpeckers also, and cardinals feeding their young earlier this year. So I’m hoping that your technique will help me do a better job next spring! Thanks for your informative article. Loved it! Thanks for the positive comment Terry – I’m glad the article was helpful for you!